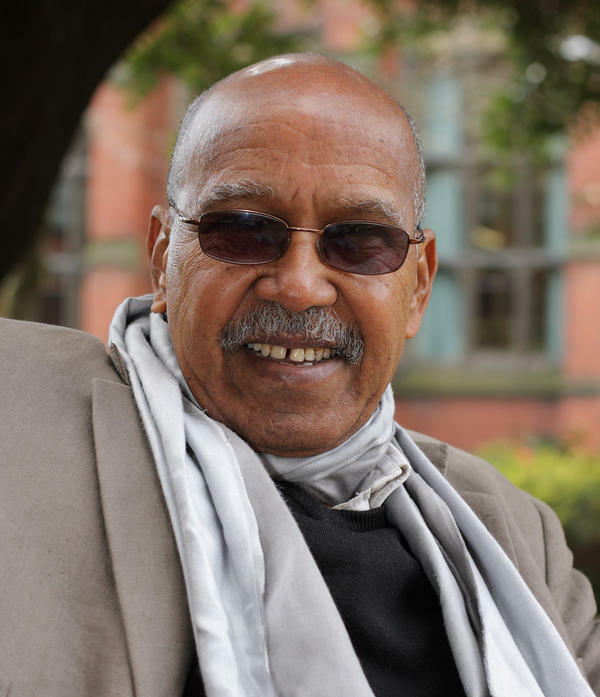 Nuruddin Farah is the author of 11 novels, including Maps, Gifts and Secrets. He is a professor of literature at Bard. Nuruddin Farah's novel Hiding in Plain Sight centers around Bella, a Somali living in Rome, who has become a famed fashion photographer. Her beloved half-brother Aar, a UN official, is murdered by extremists in Mogadishu and leaves behind two teenagers who are Bella's niece and nephew. Bella's a globetrotter, with tightly scheduled lovers and global obligations, but she feels drawn into their lives despite the opposition of Valerie — the mother who gave birth to the youngsters but left the family and doesn't know them. Farah, a Somali-born author of 11 previous novels, talks with NPR's Scott Simon about his homeland and his biggest challenge as a writer. It feels almost everything that happens in Somalia is either part of my life directly or indirectly. ... What happened in this particular case is that I had done the first draft of a novel — submitted it to my publishers — when something very similar to what happened to the character Aar happened to my sister: [she was] killed in Afghanistan in a Kabul restaurant on January 19, 2014. I go to Somalia a great deal, perhaps, in part, to feed my imagination and also to be in touch with the experiences that other Somalis go through on a daily basis. But, in terms of writing as a writer, there's always a daily challenge when one goes into one's studio to write. And the bravest thing, I think, for a writer is to face an empty page. Almost everything else is less challenging until it comes to ... someone close to you — as close as Basra was to me — fall[ing] a victim to terrorism. I actually have very little understanding of how photography works — or had very little understanding. But I had to train myself and I had to read lots and lots of books. And then, after that, had to train myself, buy a camera, and go digital/analog and do all these things. Just as there is a power structure between the novelist and the subject the novelist is writing about — it's the novelist who decides who gets the power of speech. So, whoever puts their finger on the button that ultimately decides what happens with the camera is the one who has the power. And anyone sitting outside of that power zone is turned into a subject. So, I could see parallel between the novelist's writing, and therefore, deciding, ultimately, the destiny of his or her characters — in the same way that the photographer decides what position to take, what light to use. Mogadishu has stopped being a cosmopolitan city; it was a cosmopolitan city many years ago — one of the most celebrated cosmopolitan cities. I can imagine living in Somalia, but Somalia has to change. I have changed and therefore Somalia must change. And that would be the case if: one, there was peace. Two, if I could live anonymously — which is not possible all the time, but it could be. And then, [three], if there are book shops and cultural stuff that one can do and get involved in. There is no such thing now. Civil war dominates everything in one's everyday life in Somalia, which is quite tragic. Nuruddin Farah has a new novel. "Hiding In Plain Sight" centers around Bella, a famed fashion photographer, a Somali living in Rome. Her half-brother is murdered by extremists in Mogadishu and leaves two teenagers behind - her niece and nephew. Now Bella is a globetrotter, with tightly scheduled lovers and global obligations, but she feels drawn into their futures despite - or is because - the opposition of Valerie, the mother who gave birth to them but left the family and doesn't know the children. "Hiding In Plain Sight" is the latest novel by Nuruddin Farah, the Somali-born writer who's been nominated for the Nobel Prize for Literature. He's the celebrate author of 11 previous novels that have been translated into more than 20 languages. He spends part of the year in Cape Town, South Africa, but is also a distinguished professor of literature at Bard College and joins us now from the studios of WAMC in Albany, New York. Thanks so much for being with us. NURUDDIN FARAH: Thank you. It's my pleasure. SIMON: And the story was set into motion in your mind by an event in your own life? FARAH: Well, first of all, I should say that it feels that almost everything that happens in Somalia is either part of my life directly or indirectly. And I continue writing about these events. And then what happened in this particular case is that I had done the first draft of a novel, submitted it to my publishers, when something very similar to what happened to the character Aar happened to my sister - killed in Afghanistan in a Kabul restaurant in January 2014. In that sense, it is an experience. But in that sense, it isn't an experience if you know what I'm saying. One was a literary experience that I imagined, and then when I imagined happened which is a lot more horrific when you think of it. SIMON: So when this terrible crime happened to your sister, Basra Farah Hassan, was there a part of you that felt I know this territory or did it underscore for you that these are hard things to imagine in any case? FARAH: No, they were not hard enough to imagine. And the reason is because there's a lot of that sort of thing that continues happening in Somalia. And I go to Somalia a great deal, perhaps in part to feed my imagination or also to be in touch with the experiences that other Somalis go through on a daily basis. But it came home to me when at three o'clock in the morning the phone rang, and someone from the State Department called me from Kabul saying that my sister had been a victim of a restaurant bombing. It took a very, very long time and I haven't still quite recovered from it. But in terms of writing as a writer, there's always a daily challenge, and the bravest thing I think for a writer is to face an empty page. Almost everything else is, you know, less challenging until someone close to you, as close as Basra was to me, falling victim to terrorism. SIMON: Bella of course is a photographer. And there are interesting sections in here where she talks and thinks aloud about photography. I have to begin by asking, did you set out to learn a lot about photography? Is this a hobby for you or what? FARAH: Well, this isn't a hobby for me. I actually have very little understanding of how photography works - or had very little understanding. But I had to train myself, and I had to read lots and lots of books, and some books were quite helpful - Susan Sontag's book and Roland Barthes. I have to - for me to understand something, I have to understand it intellectually before working at it. And then after that had to train myself by a camera and, you know, go digital analog and do all these things. SIMON: Well, I'm interested - Bella seems to think that there's a power relationship that transpires between a photographer and his or her subject. FARAH: Well, just as there is a power structure between the novelist and the subject the novelist is writing about. And the reason is because it's a novelist who decides who gets the power of speech. Whoever puts the finger on the button that ultimately decides what happens with the camera is the one who has the power. And anyone sitting outside of that power-zone has turned into a subject. So I can see parallel between the novelist's writing and therefore deciding ultimately the destiny of his or her character. SIMON: I have to ask, Mr. Farah, you are one of the best-known writers in the world and certainly one of the best-known Somalis in the world. Could you live in Somalia? FARAH: I could live there. But, you know, as things stand now, it's difficult for me to live there because, you know, in Cape Town - Cape Town is a cosmopolitan city now. I mean, it has been cosmopolitan city for many, many years. Mogadishu has stopped being a cosmopolitan city. It was a cosmopolitan city many years ago - one of the most celebrated cosmopolitan cities. I can imagine living in Somalia, but it has - Somalia has to change. I have changed and therefore Somalia must change. And that would be the case if one, there was peace. Two, if I could live anonymously which is not possible all the time, but it could be. And then if there are book shops and cultural, you know, stuff that one can do and get involved in. There is no such thing now. Civil war dominates everything and one's everyday life in Somalia, which is quite tragic. Well, this is not the life I would like to live. SIMON: Nuruddin Farah. His new novel: "Hiding In Plain Sight." FARAH: My pleasure, thank you. Transcript provided by NPR, Copyright NPR.